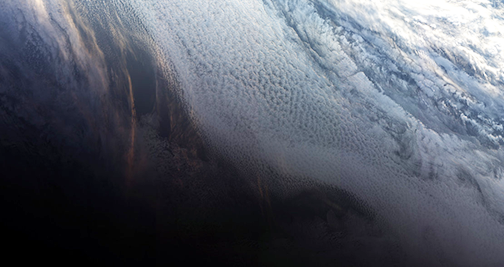 Less than two weeks after the satellite was launched, the Copernicus Sentinel-3B satellite has delivered its first images of Earth — exceeding expectations, this first set of images include the sunset over Antarctica, sea ice in the Arctic and a view of northern Europe. 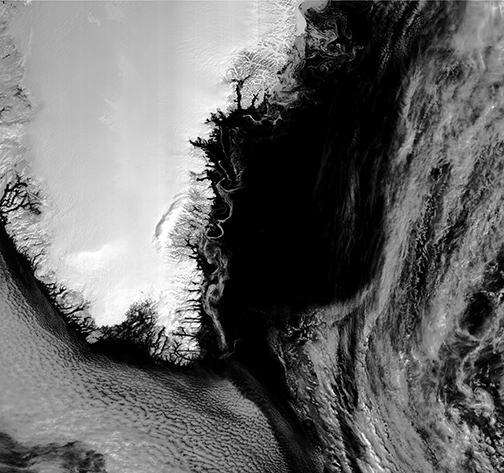 Antarctic sunset from Sentinel-3B. This image capture contains modified Copernicus Sentinel data (2018), processed by EUMETSAT, CC BY-SA 3.0 IGO. The very first image, captured on May 7 at 10:33 GMT (12:33 CEST), shows the transition between day and night over the Weddell Sea in Antarctica. The satellite also captured swirls of sea ice off Greenland on the same day. 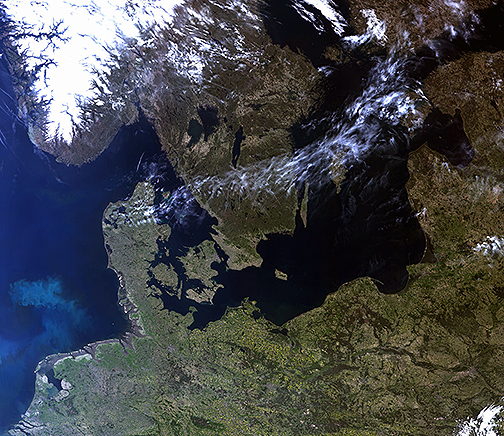 Another in this first set of images offers a rare cloud-free view of northern Europe. They were taken by the satellite’s ocean and land color instrument, which features 21 distinct bands, a resolution of 300 meters and a swath width of 1270 km. The instrument can be used to monitor aquatic biological productivity and marine pollution, and over land it can be used to monitor the health of vegetation. The Sentinel-3B satellite lifted off from Russia on April 25 and joins Sentinel-3A on orbit. This pairing of satellites increases coverage and data delivery for the European Union’s Copernicus environment program. As the workhorse mission for Copernicus, the two satellites carry the same suite of instruments to systematically measure Earth’s oceans, land, ice and atmosphere. The image of Greenland was taken by the satellite’s ocean and land color instrument, which features 21 distinct bands, a resolution of 300 meters and a swath width of 1270 km. Image contains modified Copernicus Sentinel data (2018), processed by EUMETSAT, CC BY-SA 3.0 IGO. Over oceans, the satellite measures the temperature, color and height of the sea surface as well as the thickness of sea ice. These measurements are used, for example, to monitor changes in Earth’s climate and for more hands-on applications such as for monitoring marine pollution. Over land, this innovative mission monitors wildfires, maps the way land is used, checks vegetation health and measures the height of rivers and lakes. Josef Aschbacher, ESA’s Director of Earth Observation Programs, said that the launch of Sentinel-3B completed the first batch of Sentinels that ESA is delivering for Copernicus. These first images from the ocean and land color instrument already show how the satellite is set to play its role in providing a stream of high-quality environmental data to improve lives, boost the economy and protect the world. The launch and early orbit phase were completed in a record time and next up is the commissioning of the satellite for service. The Copernicus Sentinel-3B satellite captured this rare cloud-free view of Northern Europe on 8 May 2018 at 09:33 GMT (11:33 CEST). Features over land and water can been seen clearly such as different types of land cover, snow and also a plume of phytoplankton in the North Sea. The image contains modified Copernicus Sentinel data (2018), processed by EUMETSAT, CC BY-SA 3.0 IGO. Bruno Berruti, ESA’s Sentinel-3 Project Manager, said that the organization is extremely pleased to see these first images, which show that the satellite is in good health. ESA will spend the next five months carefully calibrating the instruments and commissioning the satellite for service before the spacecraft is handed over to Eumetsat for routine operations. During this commission phase the two Sentinel-3 satellites will be flown in a tandem formation, separated by about 30 seconds. Sentinel-3B will then be phased to reach its final position — flying in the same orbit, but adjusted to be separated by 140 degrees with respect to Sentinel-3A. Once commissioned, ESA will hand over satellite operations to Eumetsat. It will then be managed jointly, with ESA generating the land products and Eumetsat the marine products for application through the Copernicus services. Alain Ratier, Director-General of Eumetsat, added that the Sentinel-3 constellation establishes the European backbone of a space-based, global ocean-monitoring system. These first images are the first demonstration that Sentinel-3B will deliver on its promise to usher in a new era for operational oceanography and flow-on benefits for human safety, businesses and industry. They will amplify the benefits of the Sentinel 3 mission for ocean forecasting and the blue economy.